Oh my, what a beautiful day last Saturday was for a wedding! A beautiful August long weekend to be close to family and friends to celebrate a very special couple. You may remember Johnny & Rene from their engagement session earlier this spring. Well, last Saturday was THE DAY- the wedding day was upon us! 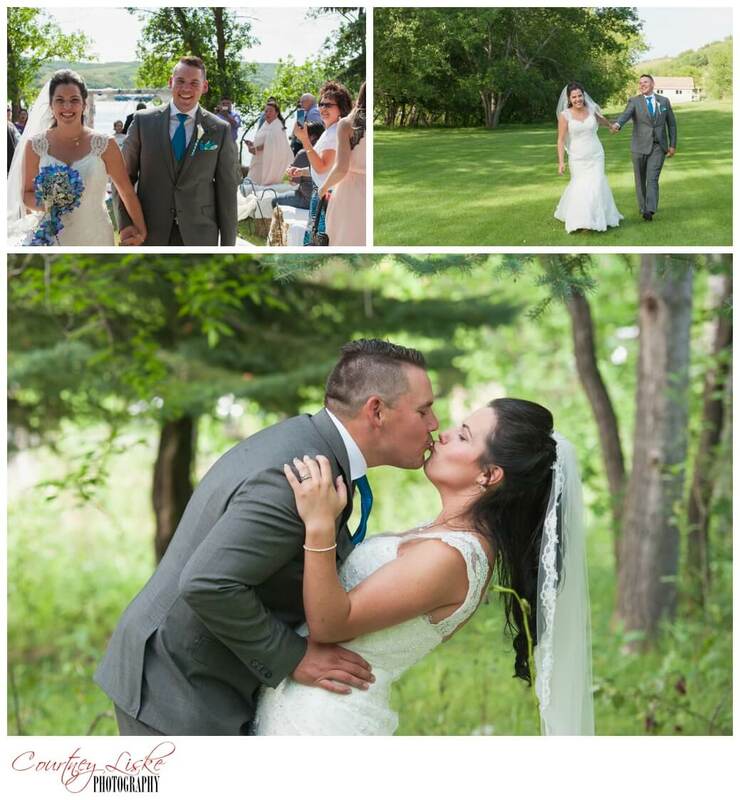 Johnny & Rene got married in the picturesque Qu’Appelle Valley. Johnny & Rene chose their location carefully, and decided to get married near the beach at Camp McKay to encompass where both of them grew up. Johnny had grown up near water in Ontario, and Rene had grown up in the Qu’Appelle Valley. Johnny & Rene had a beautiful ceremony, surrounded by many family and friends from near and far. So many special elements were included in the ceremony, including Johnny’s adorable daughters, who were flower princesses, and became good little friends of mine throughout the course of the day! Rene looked oh so ah-maz-ing in her sweetheart lace up gown. The dress fit her so perfectly, she looked absolutely gorgeous! I must say, Johnny also cleaned up very nicely- such a very beautiful couple! The details of the day came together perfectly, and all of Rene’s hard work showed in all of the teal and purple peacock inspired accents throughout. I LOVED their peacock inspired cake, complete with their amazing custom cake toppers- aren’t they awesome?! Congratulations, Johnny & Rene! Thank you for allowing Courtney Liske Photography to be there to celebrate with you on your wedding day! I hope you both enjoy some time to relax and enjoy your time together after the big day! Know that it was a beautiful day, and I wish you both the richest blessings as you begin your walk together as man and wife! Thank you, Kelly! It was a very beautiful day, and I’m so glad we were able to be a part of it! What a beautiful wedding. Your colors were perfect and I don’t think I’ve ever seen a bride smile like you. Your happiness just shone through your eyes and face.